Penn’s Graduate School of Education has moved into the #2 position in U.S. News & World Report’s 2020 rankings for graduate schools of education – its highest ranking ever. The ranking marks the fourth consecutive year Penn GSE has been in the top 5. 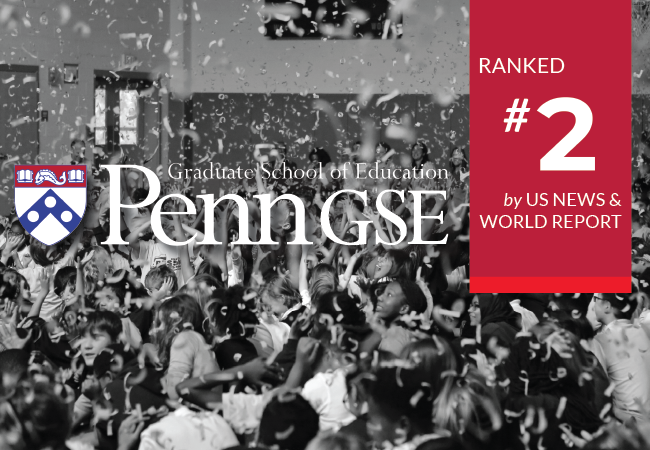 Penn GSE also had its best year yet in the specialty rankings from U.S. News & World Report. For 12 years running, Penn GSE's leadership in the world of education policy has been reflected with top 10 positions – the Education Policy Division remained #6 nationally, and the Higher Education Division moved up to #7. For a second year, Penn GSE’s Education Administration programs made the specialty rankings. Also debuting as top-ranked areas of strength were Penn GSE’s work in Educational Psychology and Curriculum. “We’re thrilled to be ranked among the very top schools of education in the nation,” said Dean Pam Grossman. “The rankings are simply one way our impact is measured. On a daily basis, I hear about the exceptional work being done here at the school and about how our extraordinary faculty, students, staff, and alumni are working to create educational opportunities locally, nationally, and globally." Grounded in a commitment to research backed up by over $55 million in funded work, Penn GSE is an Ivy League school committed to finding solutions to the challenges facing education. World-renowned faculty are among the most accomplished in their fields. Students have tremendous opportunities to develop tight-knit relationships with education’s leading scholars and participate in cutting-edge research. With some of the most selective doctoral programs in the country, Penn GSE has approximately two doctoral candidates for every faculty member. Master’s students benefit from a rigorous atmosphere that emphasizes real-world applications for every lesson. Penn GSE also offers a range of executive-style degrees that prepare professionals to be thought leaders and innovators in the evolving education landscape. Current students and graduates have access to career services support through both the University of Pennsylvania and Penn GSE’s own in-house, nationally certified career counselor who specializes in the education marketplace. Graduates join a powerful alumni network that includes teachers and leaders, entrepreneurs, and college presidents.